The biggest celebration for Hindus, the festival of lights (Diwali or Deepavali), is celebrated on the amavasya night of the month of Ashvin (usually in late October or early November). The festival, which celebrates among many things, the return of Lord Rama (of the Ramayana) to his native land of Ayodhya after completing fourteen years of stay in the forest with his wife Sita and brother Lakshmana. The common folk of the kingdom of Ayodhya were so happy to have their native son and heir to the kingdom back in their midst that they celebrated by lighting lamps all over the land – hence the name Deepavali – which literally means ‘string of lights’. In 2016, Deepavali will be celebrated on October 30th (India), and is marked as a traditional New Year by many communities in India. 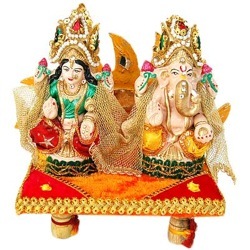 One of the signature events on Diwali in most households is the riti of Lakshmi-Ganesha Puja – homage to Lakshmi and Ganesha.The focus of the Diwali puja is on creating an atmosphere in the home to make it suitable for an invitation to Goddess Lakshmi. The preparations begin days or weeks ahead with a thorough cleaning of the house from top to bottom. Diwali is a great occasion for people to get their homes painted, to buy new furniture and drapes and in general to “dress up” their homes for this special guest! A clean, lit-up environment for Lakshmi sets the stage for her to visit our homes on this auspicious night. Lakshmi, the goddess of wealth, is known as the consort of Vishnu, the preserver. She is the power of multiplicity and the goddess of fortune, both of which are necessary for preservation. According to the puranas, she was incarnated as the daughter of the sage Bhrigu and his wife Khyati. She was later born out of Ksheer Sagar (ocean of milk) while being churned during samudra manthan. As consort of Vishnu, she is born as his spouse whenever he incarnates. When Vishnu appeared as Vamana, Parasurama, Rama, Krishna, she appeared as Padma or Kamala, Dharani, Sita and Rukmini, respectively. She is as inseparable from Vishnu as speech from meaning or knowledge from intellect, or good deeds from righteousness. Vishnu represents all that is male and Lakshmi, all that is female. Lakshmi is enchantingly beautiful, and is standing on a lotus holding lotuses one in each of her hands and is called Padma, or Kamala. She is also adorned with a lotus garland. Often, elephants are shown on each side, emptying pitchers of water over her, the pitchers being presented by celestial maidens. In the company of Vishnu, Lakshmi is shown with two hands only. When worshipped in a temple, she is shown seated on a lotus throne, with four hands holding padma, shankha, amritha kalasha (pot of ambrosia) and bilva fruit. Her four hands signify her power to grant the four type of purusharthas (aims of human life) – dharma (righteousness), artha (wealth), kama (bodily pleasures), moksha (beatitude). Lakshmi puja (prayers to Goddess Lakshmi) forms the cornerstone of the Hindu festival of lights on the Diwali Amavasya (or third day of Diwali). Translation: We completely surrender ourselves to that Goddess who embodies auspiciousness, who is full of auspicious-ness and who brings auspicousness to us. Like all puja ceremonies in Hinduism, Diwali Puja also begins with an invitation to Lord Ganesha to bless the occasion – he of the single tusk, whose vehicle is the mouse and he who penned the Mahabharata with his own hands. Salutations to the supreme Lord Ganesha, whose curved trunk (vakra-tunda) and massive body (maha-kaayaa) shines like a million suns (surya-koti) and showers his blessings on everyone (sama-prabhaa). Oh my lord of lords Ganesha (kurume-deva), kindly remove all obstacles (nir-vighnam), always (sarva-) and forever (sarvadaa-) from all my activities and endeavors (sarva-kaaryeshu). Editor’s Note: We wish all our readers a very happy Diwali and a prosperous (Hindu) New Year. May Lord Ganesha remove all your obstacles and Goddess Lakshmi bestow you with all the wealth you desire – in all areas of your life – physical, mental, emotional, and above all, spiritual. How do you celebrate Diwali, keep the traditions alive? Any special celebrations this year? Please share with our readers in the comments. Its quite interesting to have found the site where i could find the ethics,practices & significiance of the traditional Hindu sastras & Mantras, once practises all over the Indian Sub continent. I do expect that once the age-old Hindu practices are re-installed along the basic foothold of society,then again our social life will become disciplined & prosperous. Always keep Us,the young generation,attached to the Hindu Tradition & Practices through alike portals.Thank You all… IM/Kol.